At the Nature Conservancy of Canada (NCC), field work is an integral part of many staffers' routine, be it leading volunteer events or conducting various conservation activities. When it comes to spending time outdoors, it is important to be knowledgeable about and take precautions against critters that may pose a health risk. One of the critters that has garnered media attention of late is the tick. Certain species of ticks transmit Lyme disease, and reports of Lyme-carrying ticks are spreading in Canada. Tick season typically starts mid spring and can run until October in parts of Canada. Remember to watch out for these little free-loaders if you’re spending a lot of time outside or in the field, especially in areas known to have an abundance of ticks. Here are a few tick tactics to keep in mind when heading out into the field this season. Be aware of areas where ticks live and thrive. If you're hiking, try to walk in the center of the trail. If you need to take a break, sit on a rock instead of on the ground. Wear long-sleeved shirts and long pants to keep your skin protected from ticks. Cover your head with a hat, tucking in any long hair, and wear high boots if you have them. Ticks are usually found close to the ground, so tucking your pants into your socks or boots may provide extra protection. You should also make sure there aren't any gaps in your clothing that ticks could get into. Wearing light-coloured clothing can help you can see ticks more easily and give you time to brush them off before they become attached to your skin. Use insect repellent on clothing that may come in contact with grass and brush. Repellents that contain DEET are the most effective, but make sure you apply according to the directions. If possible, ask someone to check your head and back. With tweezers, gently grasp its head and mouth parts as close to your skin as possible. Slowly pull the tick straight out – do not jerk or twist it. Try not to squash it. Do not apply matches, cigarettes, or petroleum jellies to the tick as these may cause an infected tick to release the bacteria into the wound. Save the tick in a clean, empty pill bottle or double zip-lock bag. Do not add any ventilation holes. You can put more than one tick in the container if they are found on the same person or in the same general area in the environment. Add a small piece of tissue, lightly moistened with water, to keep the tick(s) alive. 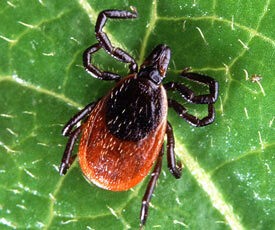 Call ahead to the health office or veterinarian to submit your tick. Reminder: Please check your first aid kits to ensure they contain the materials listed above for tick removal and storage. Lyme disease is an infection that is spread by ticks. You can get Lyme disease if you are bitten by an infected tick. However, most people who have had a tick bite don't get Lyme disease. 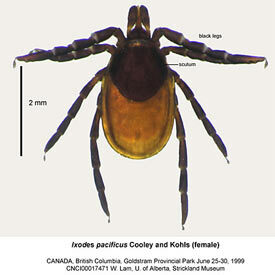 Two types of ticks transmit the Lyme disease bacteria in Canada: deer ticks and western blacklegged ticks. Initial signs of Lyme disease are a round, red rash that spreads at the site of a tick bite. This rash can get very large. Flu-like symptoms are also common. People in the early stages of Lyme disease may feel very tired and have headaches, sore muscles and joints, and a fever. These symptoms can start at any time, from three days to up to a month after you have been bitten. Some people don't have any symptoms when they are in the early stages of Lyme disease. They may not even remember getting a tick bite. Ticks are becoming more common in parts of the Atlantic provinces, southern B.C., Manitoba and Quebec. Given the weather conditions in the past winter with much insulating snow, it could lead to a bad tick season this summer. 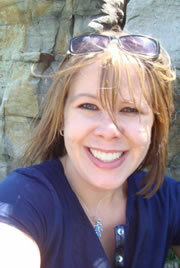 Kailey Setter is the national manager of conservation engagement at the Nature Conservancy of Canada. Read more about Kailey Setter.